Home Running Injuries Knee Will running barefoot fix my runner’s knee? Barefoot running has taken a bit of a bashing recently. A number of prominent articles have stomped on its unprotected toes. A new breed of shoes with maximal support is on the horizon and some have predicted the end of the barefoot era. That said, recent research has suggested barefoot running may have a role for treating Patellofemoral Pain Syndrome. So should you ditch your shoes if you have runner's knee? They reported a 12% reduction in peak joint stress. Their research mirrored findings from previous studies and concurred with recent research suggesting an increase in shoe heel height increased PFJ load during walking. It would appear then that in theory running barefoot may reduce patellofemoral load and therefore help with runner's knee. The in theory bit is quite important because this study was only on healthy volunteers and doesn't demonstrate any change in symptoms in those with runner's knee. The research by Bonacci et al. (2013) is interesting as it highlights potential benefits of barefoot running but it has a host of limitations that prevent it from being adopted by the general population. These include a small sample size, no demonstration of symptom change in subjects with patellofemoral pain and question marks about the model used to calculate PFJ load. Something to consider with running style and shoe selection is that the force involved in impact is difficult to reduce, instead we tend to move it. So while the load on the patellofemoral joint may be reduced, barefoot running tends to increase load on the calf muscles, achilles tendon and forefoot. You may find then that you swap runner's knee for calf pain, achilles tendinopathy, plantar fasciitis or “metatarsalgia”. Recent research has highlighted some of these risks. Ridge et al. (2013) demonstrated an increase risk of bone marrow oedema (a sign of bone stress and a precursor to stress fracture) with transition to minimalist shoes. Barefoot running may increase risk of metatarsal stress fracture as demonstrated in these case studies. Shoe selection is a complex area, as discussed expertly here by Simon Bartold. So there may be risk of injury with switching to barefoot, is the benefit worth the risk? Is a reported 12% reduction in PFJ stress enough to change symptoms? Will those with runner's knee experience a similar reduction to the healthy subjects? At present we simply don't know. It's a murky area, potential risk vs minimal evidence of substantial benefit. Are there better treatment options for runner's knee? Modifying stride length is a fairly simple solution to reduce load on the PFJ. In addition you may consider trail running rather than road running as the uneven surfaces offroad lead to variation in load patterns which can prevent overloading certain structures. Modify your training by reducing distance, changing speed or adding rest days to find a way that is more comfortable on your knee. Reducing hill training and speed work are also likely to reduce load. One final thing not to overlook is your weight. High BMI has been associated with increase risk of injury and significantly more load on the knee joint. Research in overweight patients found for each pound of weight lost there was a four-fold reduction in the load exerted on the knee. The average BMI of patients in this study was 34 which ties in with a large previous study which found runners with a BMI of over 30 had significantly higher risk of injury. The message here may be that if you have runner's knee and a BMI of over 30 your first priority may be to lose weight rather than lose your shoes! A key factor in runner's knee is improving how well you can manage the load involved in running. This can be achieved by strengthening the quads and gluteal muscles, improving movement control and addressing biomechanical factors associated with the problem. This is discussed in more detail in our series on runner's knee (PFPS). A multifactorial problem requires multifactorial solution. Lankhorst et al. (2013) performed a systematic review of factors associated with patellofemoral pain. They found 523 factors examined by the literature! It's unlikely that manipulating just one of these factors will provide a lasting solution. Of these some will be more significant than others and each patient is likely to have a different combination of contributing factors including muscle strength and function, motor control, tissue flexibility, biomechanics, BMI, loading habits, work and social considerations, sporting activity etc etc. 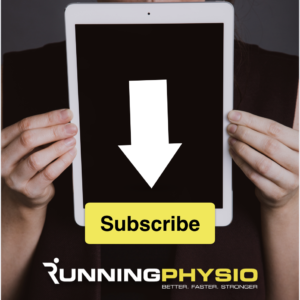 My advice for those with persistent runner's knee would be to see a Physio to help identify which factors are key to your problem and how to overcome those. If you are considering changing shoes and want to try a barefoot approach that's fine. I'm not anti-barefoot per se but I advocate making an informed choice. If you know the pros and cons you can make a better decision. Perhaps a middle ground would be try 'zero drop' shoes that are similar to barefoot running but retain some cushioning. If possible try them on the treadmill or buy from a store that gives a 30 day period for you to try out shoes. See how your symptoms respond. As Simon Bartold noted recently using a mix of running shoes can be beneficial. Perhaps try shorter runs in a minimalist shoe and longer runs with more support. If you choose to do this I would combine it with strength and conditioning targeted at areas that are key to your patellofemoral pain, and…make the transition gradually! Closing thoughts: For many that experience an injury, especially one that stops them running, the idea of an quick, easy solution is an attractive one. Sadly in the vast majority of cases there is no quick fix. I don't recommend ditching your shoes in the hope that your knee pain magically disappears! There is a lot of 'one size fits all' advice for runners and in many cases it can be misleading and unhelpful. We aren't in a position to claim barefoot is best for everyone with patellofemoral pain. Equally it's hard to justify saying everyone should wear supportive shoes with little evidence for this approach. With so many factors involved it's difficult to determine exactly how much of a role shoe selection plays. Every runner will be different – find out what's key to your recovery. The Bonacci et al study did show a decrease in loads of 12% in healthy people, but with an increased cadence to achieve that reduction – so 12% reduction in peak load, but taking more steps does not mean the cumulative load is decreased. A clinical trial is desperately needed. Bonacci et al also did not report where the loads went up in order to decrease the knee loads. You can’t decrease the load in one tissue without increasing it in another. Kulmala et al also showed a decrease in knee loads, but also reported on other loads as well and showed the ankle loads went up to get the decrease in knee loads. I have been troubled by inner knee pain on and off for years which stops me running as much I would like. I am 53 years old, have run two marathons (slowly) but would not describe myself as athletic in any way. While training for my nest marathon, my knee began to hurt again so I switched to the elliptical trainer to keep up my fitness levels – keeping the resistance moderate so that I wasn’t putting force on my knee. I found something very interesting. At first I was aware of minor discomfort in my knee while I was on the machine. After 30 minutes the discomfort had completely gone and I was able to increase my speed (still with moderate resistance) for another 30 minutes. I could have continued much longer but I was getting bored, rather than tired. It seems that once all my muscles were warmed up the pain in the knee went away on its own which makes me think that it might be caused by muscle stiffness rather than any serious injury to the knee itself. I get exactly the same on the cross-trainer. I can carry on for hours, I actually did 25km on the eliptical the other day without discomfort for my knee. As soon as I hit the road or even when I run on the trademill my knee carries me for two-three km without pain, then I start feeling discomfort till the point that I have to stop because it becomes unbearable. I can’t even reach 10km anymore. It is so frustrating because I got until the last 4 weeks of my (first!) marathon preparation and it looks like I’ll have to give that up. I just bought the barefoot running shoes as last desperate move. Looking forward to try them on. I have been to two physios, done acupuncture, ice, exercises, anti inflammatory, gels, different type of taping, knee straps and you mention it I have done it. Nothing eased the pain yet. the only thing I haven’t done is proper resting, and I guess it may be the only solution for me. Thanks for the excellent and informative article.